The lazy days of summer are officially over for my kids. It’s back to school which means I’ve got to come up with some great lunch ideas. 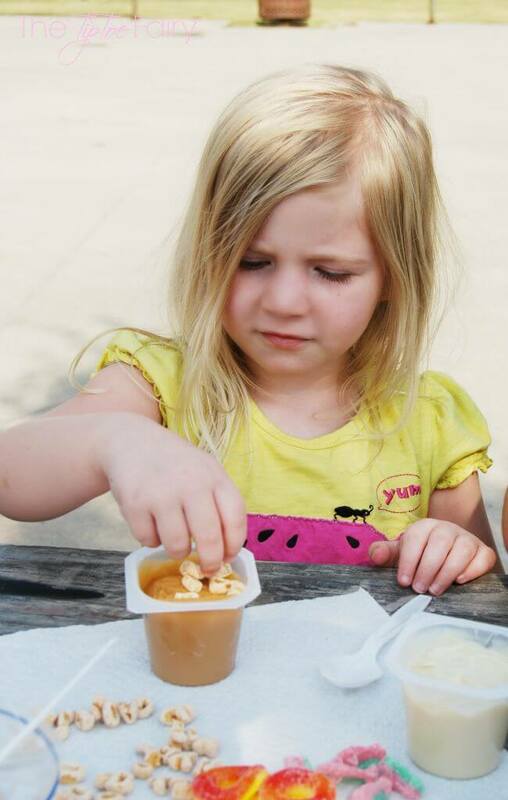 On some days, I like to send a sweet treat to school like Snack Pack® puddings. Snack Pack® puddings are some of my kids favorites. It’s perfect for lunches, and it’s perfect for after school snacks, too. I always keep a pack or two in the fridge. Two of my kids have already started school, so I decided to do something a little fun on the first day of school. 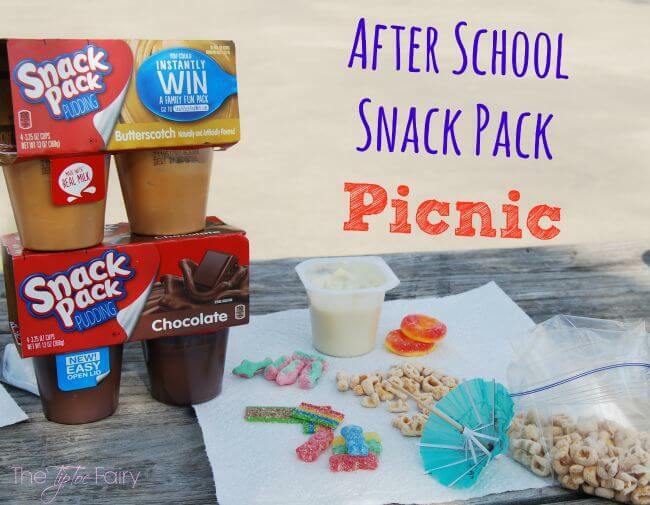 When I picked them up from school, we went to the playground and had a little Snack Pack® Picnic. I got the supplies to make two kinds of treats. We made Sandy Beach Pudding cups to say goodbye to summer, and we made Alphabet Soup pudding cups to say hello to school. Adding mix-ins to pudding is always a fun treat. This one was supposed to look like alphabet soup. I was surprised this one was so much fun for them. They started spelling out words with the cereal before they’d mix it in. Snack Pack® pudding in vanilla. This was a little sandy beach with an umbrella, beach towel, life preserver, and towel with a little sour man. This was a lot of fun to make with all the different mix-ins. It’s also not complicated. My 5 yr old had no problem making her own sandy beach. How do you celebrate back to school with your kids? This Back to School season take a moment to slow down and enjoy a tasty and fun treat with the kids. 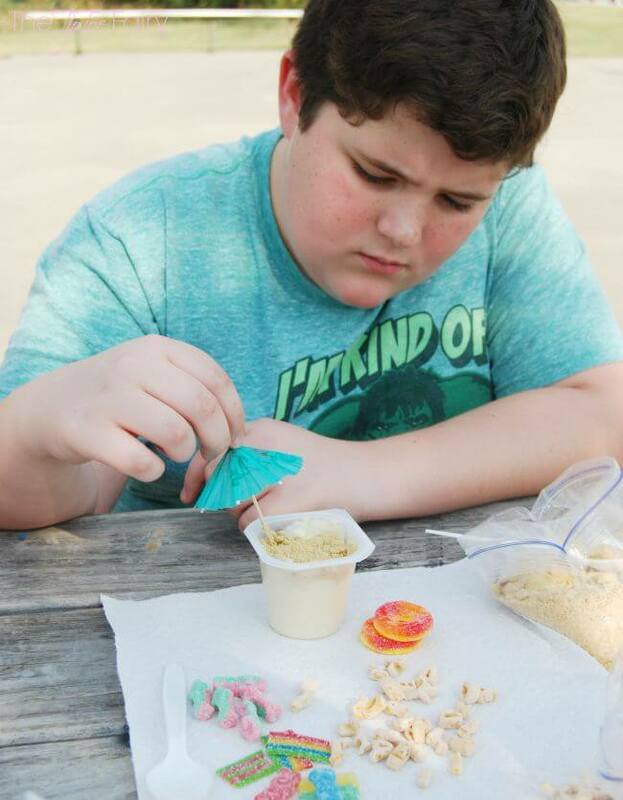 Snack Pack comes a variety of flavors and offers endless mix-in opportunities the kids can help prepare. Each serving of Snack Pack is fortified with as much calcium as an 8-oz glass of milk,* so you can feel good about serving your kids Snack Pack. For mix-in inspiration, visit Snack Pack on Pinterest and Facebook ). My kids love these! I always make sure I have some on hand for my boys. Butterscotch is their favorite. Oh the sandy beach pudding looks so cool! That’s so creative, I could see making these for a beach themed birthday party. What a fun thing to do after the first day of school! 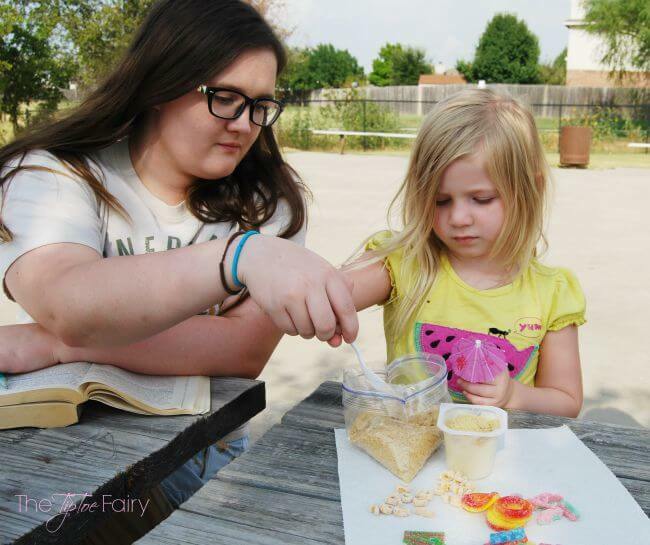 Sounds like your children loved helping with this activity and even used it do some back to school spelling! Sounds like a win all around. Brilliant idea to use an alphabet cereal to get the kids to keep learning with their snack. That beach snack is really fun! I love Snack Packs for snacks for the kids. 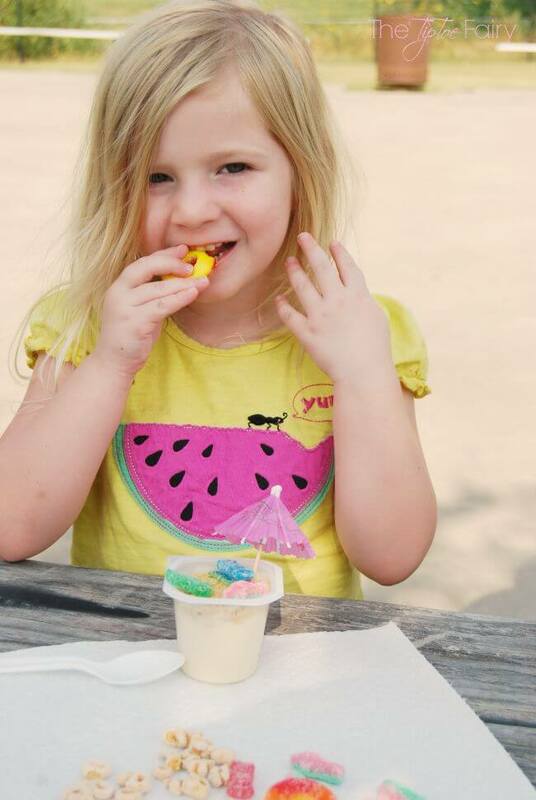 The Sand Beach Pudding is such an adorable idea and I will have to do this for my niece’s kids when they come. Thanks for sharing. These are one of my kids’ favorite after school snacks. What a fun way to jazz up the pudding! I love these ideas! The sandy beach pudding looks so cute. My girls will love this. Love, Love it! We stay after school quite a bit and play at the playground. The kids would love the idea of some fun snacks. Such great photos. Even I love snack packs. Love vanilla the best I think. We have made edible fingerpaints with these, love the beach bear idea. My kids love these puddings. I just bought a case of them at Coscto a few days ago. 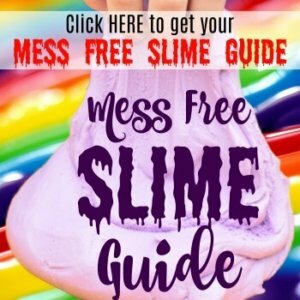 A great fun food for kids. I bet they really enjoy it and enjoy making it with parents. This is really cute. What a special treat to have with the kids! Yum! That looks so good. I love the sandy beach one. I might have to make a couple of those just for ourselves. This is such a fun snack! I love mix-it ins or do it yourself snacks! The beach pudding is so cute! I love that little picnic concept. Very adorable kids too! These are great ideas for dressing up a snack pack! My kids love to take these in their lunch and to have as an after school snack too. My kids always got snack pack, they’re really love it. I’d love to try your idea, this is great combination. Ok this is just the cutest idea ever!!! 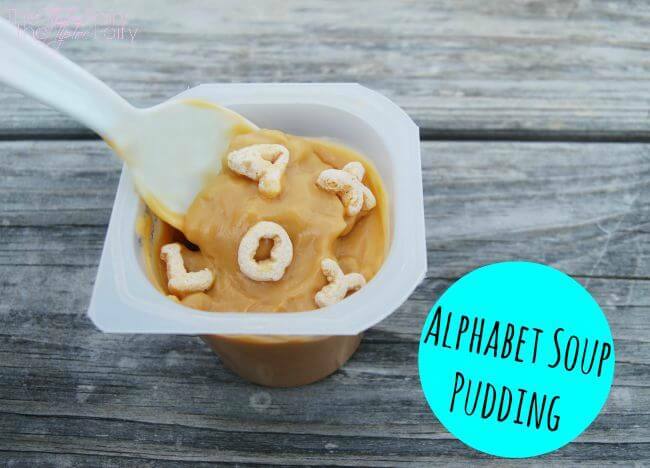 My daughter is ABC obsessed and putting abc’s in pudding! Genius! Wow! I feel like having a picnic tomorrow afternoon with the kids. What an amazing idea! 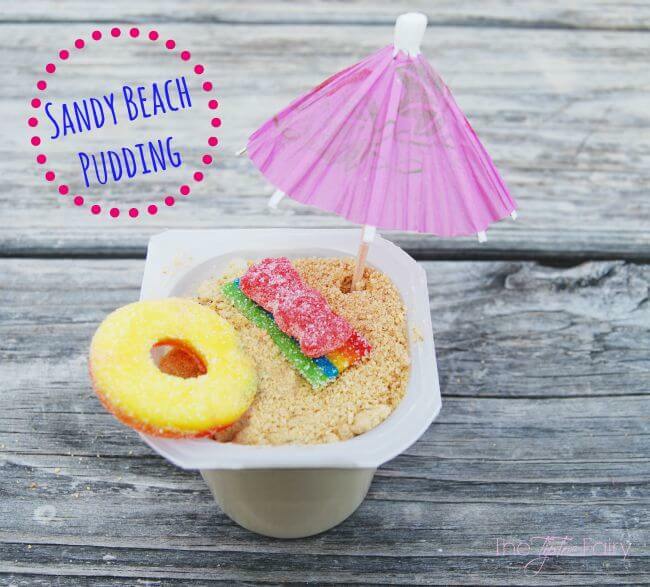 The Sandy Beach Pudding is super clever! Anything with graham cracker crumbs is A-Ok in my book!